Mr. and Mrs. Dursley, o nummer fower, Privet Loan, were prood tae say that they were gey normal, thank ye awfie muckle. They were the lest fowk ye wid jalouse wid be taigled up wi onythin unco or ferlie, because they jist widnae hae onythin tae dae wi joukery packery like yon. 2017 will see an auspicious alignment of anniversaries. 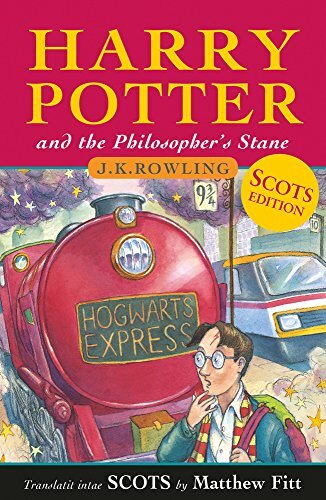 J. K. Rowling's debut novel Harry Potter and the Philosopher's Stone has already been translated into a staggering 79 languages—Itchy Coo's Scots translation will be language number 80. Since 2002, the Itchy Coo imprint has been wowing young readers and challenging old attitudes with bold new translations of books by Roald Dahl, Julia Donaldson, David Walliams, Alexander McCall Smith, A.A. Milne, Asterix and others—and done it all in the wonderful Scots language which has the power to engage, excite and entertain readers of all ages. Matthew Fitt's translation of J.K. Rowling's phenomenal adventure story will break new ground and earn a place in hearts of young Scots readers and Harry Potter fans alike. If you have any questions about this product by Black & White Publishing, contact us by completing and submitting the form below. If you are looking for a specif part number, please include it with your message.